Years of building pressure in many parts of the world, at least since the global financial crisis,1 crystallized into dramatic political results during 2016 as public disaffection with the status quo gained traction. In the West, consensus expectations were defied by the United Kingdom’s decision to leave the European Union, by President-elect Donald Trump’s victory in the United States and by the Italian electorate’s rejection of Matteo Renzi’s constitutional reforms. The implications of results such as these are potentially far-reaching – some people question whether the West has reached a tipping point and might now embark on a period of deglobalization. 2 But the uncertainty and instability that characterized 2016 are not Western phenomena alone: we saw variations of them in countries across the world, including Brazil, the Philippines and Turkey. strengthening our systems of global cooperation. The remainder of Part 1 looks at each of these challenges, drawing on the latest Global Risks Perception Survey (GRPS) to identify potential trigger points that might create new risks, exacerbate existing risks or – an under-appreciated possibility – provide opportunities to do things differently in a way that mitigates risks. Part 1 concludes with a reflection on environmental risk, which again stands out in the GRPS as a source of concern, and which would be particularly vulnerable to any loss of momentum in global cooperation. Despite unprecedented levels of peace and global prosperity, in many countries a mood of economic malaise has contributed to anti-establishment, populist politics and a backlash against globalization. The weakness of the economic recovery following the global financial crisis is part of this story, but boosting growth alone would not remedy the deeper fractures in our political economy. More fundamental reforms to market capitalism may be needed to tackle, in particular, an apparent lack of solidarity between those at the top of national income and wealth distributions and those further down. Economic concerns pervade the latest GRPS results. This is not immediately evident from the evolution of the top-five risks by impact and likelihood, as illustrated in Figure 2, which shows economic risks fading in prominence since the height of the global financial crisis, and missing entirely for the first time in the latest survey. However, in addition to asking respondents to assess the impact and likelihood of individual risks, the survey asks ask them to consider the influences and interconnections that shape the risk landscape. Here the economy is paramount. “Growing income and wealth disparity” is seen by respondents as the trend most likely to determine global developments over the next 10 years (see Table 1.1), and when asked to identify interconnections between risks, the most frequently mentioned pairing was that of unemployment and social instability (see Table 1.2 and Appendix A). Source: World Economic Forum Global Risks Perception Survey 2016. This is not the only source of concern about exceptional monetary policies. Sustained low interest rates can distort the financial mechanisms that underpin healthy economic activity: they make it unusually cheap for struggling companies to roll over their debts, inhibiting the process of re-allocating resources from inefficient to more innovative parts of the economy. This in turn complicates the process of clearing the debt overhangs that in many countries remains an unresolved legacy of the pre-crisis boom, weighing on growth by diverting income towards debt servicing rather than fresh consumption or investment. Is it time for the pendulum to swing from monetary to fiscal policy? In the United States, President-elect Trump campaigned on the promise of increased infrastructure spending, and globally there is tentative evidence of a gradual move towards fiscal loosening.17 This presents its own risks: borrowing costs for governments have been exceptionally low in recent years, but if investors were to re-price risk sharply, the adjustment this would require from high-deficit countries could have significant economic and political consequences. However, it is not only concerns about market responses that shape governments’ reluctance to turn to fiscal policy. Policy preferences matter too. 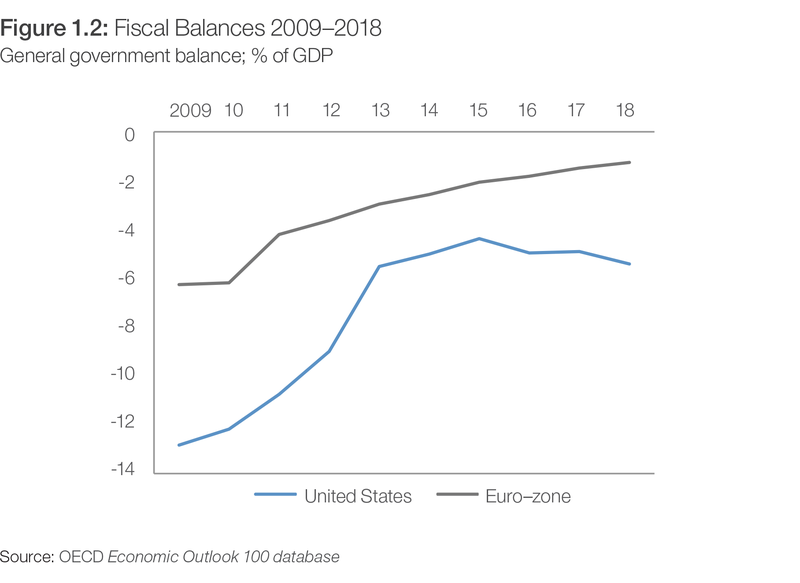 In the Eurozone, for example, governments have been slow to respond to repeated exhortations from Mario Draghi, the president of the European Central Bank, to find more space for fiscal loosening.18 Using Organisation for Economic Co-operation and Development (OECD) data, Figure 1.2 illustrates the divergence of fiscal trends in the United States and Eurozone since 2015. Beyond monetary policy and fiscal stimulus, productivity growth has also been slow to recover from the crisis. Structural rates of unemployment remain high, particularly among young people in Europe, and the United States has seen a marked slump in labour participation rates. And in contrast with the pre-crisis era, when China’s rapid expansion bolstered overall growth rates, there is no emerging-market game-changer on the horizon.19 China is in a gradual slowdown as its economy transitions from an investment-led to a consumption-led growth model, and many other emerging markets are undergoing a traumatic adjustment to the end of a commodities super-cycle that underpinned much of their growth so far this century. In sum, it is difficult to identify routes that will lead back to robust global rates of economic growth. However, growth is now only part of the challenge policy-makers need to address. Concerns over income and wealth distribution are becoming more politically disruptive, and much greater emphasis is needed on the increasing financial insecurity that characterizes many people’s lives. As socio-economic outcomes are increasingly determined globally, popular frustration is growing at the inability of national politics to provide stability. Economist Dani Rodrik coined the phrase “the globalization trilemma” to capture his view that, among democracy, national sovereignty and global economic integration, only two are simultaneously compatible – and recent events in Europe and the United States suggest an appetite for rebalancing towards democracy and national sovereignty. The combination of economic inequality and political polarization threatens to amplify global risks, fraying the social solidarity on which the legitimacy of our economic and political systems rests. New economic systems and policy paradigms are urgently needed to address the sources of popular disenchantment.20 These could include more effective human capital policies, to enable more people to benefit from skill-biased technological change; better public goods (whether publicly or privately provided) to address the ambitions of the growing middle class around the world; and more responsive governance systems to empower individuals at the local level without sacrificing the many benefits of globalization. In the latest GRPS, respondents ranked “increasing polarization” as the third most important trend for the next 10 years – it was cited by 31% of respondents, with “increasing national sentiment” cited by 14%. The survey recorded an increase in the perceived impact of “failure of national governance” but, perhaps surprisingly, “profound social instability” dropped in the rankings for both perceived likelihood and impact. One possibility is that the global decision-makers who mostly comprise the GRPS panel have not been sufficiently attuned to this risk. Another way of interpreting the GRPS, however, is to focus on the underlying trends rather than the risks. By placing both polarization and intensifying national sentiment among the top five trends (see Table 1.1), GRPS respondents have highlighted long-term patterns that, if they persist, are likely to continue to amplify a range of social and political risks. 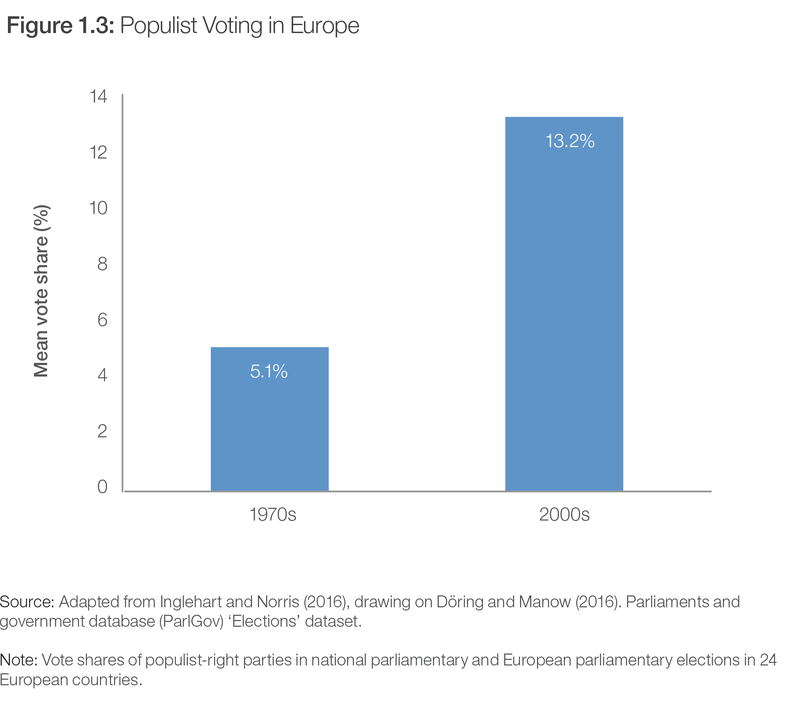 Evidence suggests that technological change provides a better explanation than globalization for the industrial decline and deteriorating labour-market prospects that have catalyzed anti-establishment voting in many of the world’s advanced economies. Today’s world is one in which production, mobility, communication, energy and other systems are changing with unprecedented speed and scope, disrupting everything from employment patterns to social relationships and geopolitical stability. Driven by the convergence between digital, biological and physical technologies, the Fourth Industrial Revolution (4IR) is creating new global risks and exacerbating existing risks. Perhaps because of the increasing ubiquity of innovative technology, respondents to the GRPS have tended not to include technological risks among the most impactful or the most likely to occur. This can be seen in the comparatively few technological risks that appear in the evolving risk matrix (Figure 2). There are possible signs of change, however. The year 2014 was the first in which two technological risks made it into the evolving risk matrix, and this year, although only one is included (“massive incident of data fraud/theft”), another (“large-scale cyberattacks”) came sixth in the list of risks most likely to occur in the next 10 years. According to the economists Michael Hicks and Srikant Devaraj, 86% of manufacturing job losses in the United States between 1997 and 2007 were the result of rising productivity, compared to less than 14% lost because of trade. Most assessments suggest that technology’s disruptive effect on labour markets will accelerate across non-manufacturing sectors in the years ahead, as rapid advances in robotics, sensors and machine learning enable capital to replace labour in an expanding range of service-sector job. Estimates of the number of jobs at risk to technological displacement vary: a frequently cited 2013 Oxford Martin School study has suggested that 47% of US jobs were at high risk from automation; in 2016 an OECD working paper put the figure lower, at 9%.33 In 2015 a McKinsey study concluded that 45% of the activities that workers do today could already be automated if companies choose to do so.34 As discussed in Chapter 3.1, respondents to this year’s GRPS rate artificial intelligence and robotics as the emerging technology with the greatest potential for negative consequences over the coming decade. We are in a highly disruptive phase of technological development, at a time of rising challenges to social cohesion and policy-makers’ legitimacy. Given the power of the 4IR to create and exacerbate global risks, the associated governance challenges are both huge and pressing, as further discussed in Part 3. It is critical that policy-makers and other stakeholders – across government, civil society, academia and the media – collaborate to create more agile and adaptive forms of local, national and global governance and risk management. In a worrying sign of deteriorating commitment to global cooperation, states are stepping back from mechanisms set up to underpin international security through mutual accountability and respect for common norms. For example, 2016 saw Russia, South Africa, Burundi and Gambia withdraw from the International Criminal Court, and China reject the verdict of the international tribunal on the South China Sea. At the time of writing, the incoming US president is considering withdrawal from the recent Joint Comprehensive Plan of Action (Iran nuclear deal) and the Paris Climate Change agreement. The exit of major stakeholders from economic agreements such as the Trans-Pacific Partnership and Trans-Atlantic Trade and Investment Partnership also carries geopolitical significance. In Syria, the drawn-out nature of the war indicates how the absence of a great-power accord handicaps the United Nations, compounding the difficulties of brokering a settlement to a conflict with multiple stakeholders at global, regional and non-state levels, or even organizing a limited intervention to facilitate humanitarian relief or protect civilians. The death toll among non-combatants – including from chemical weapons – has been met with despairing rhetoric but no effective action to enforce long-standing humanitarian laws and norms. In parallel to their withdrawal of support for collective solutions, major powers now openly trade accusations of undermining international security or interfering in their domestic politics. For years President Putin has accused the United States of seeking to undermine global stability and Russian sovereignty, and in 2016 the US National Security Agency blamed Russia for interference in the presidential election. Tensions rose between the United States and China over freedom of navigation in the South China Sea and the deployment of US missile defence systems to the Republic of Korea, which led to Beijing warning the United States not to “harm China’s strategic security interests”. In response to the general loss of faith in collective security mechanisms, regional powers and smaller nations are increasingly exploring the acquisition of new conventional weapons capabilities, offensive cyber weapons and even nuclear ones. Notwithstanding the normative and practical obstacles confronting a state seeking nuclear capability, political leaders in nuclear and non-nuclear weapons states alike have increasingly made reference to the utility of nuclear weapons in the context of changing threat perceptions and wavering confidence in alliance structures. If this rhetoric turns into policy, it could entail a huge diversion of resources into a new nuclear arms race and a jump in the risk of pre-emptive strikes aimed at preventing an adversary gaining nuclear capability. In summary, developments in 2016 present numerous reminders that international security requires collective commitments and investment to define a positive vision, as well as political will to make responsible trade-offs and commit resources (Box 1.1). As technological, demographic and climate pressures intensify the danger of systems failure, competition among world powers and fragmentation of security efforts makes the international system more fragile, placing collective prosperity and survival at risk. First, international cooperation is giving way to unilateral or transactional approaches to foreign policy just as a host of issues – such as global growth, debt and climate change – demand urgent collective action. If allowed to fester, such issues could spawn a range of new problems with costs falling disproportionately on fragile communities. Second, the inter-connected nature of the global system produces cascading risks at the domestic level. In Syria, for example, failures of governance have produced civil conflict, driving migration that transfers economic, social and political pressures into countries already experiencing frustrations with low growth and rising inequality, fuelling radicalization and acts of violence. Third, a declining sense of trust and mutual good faith in international relations makes it harder to contain the resulting pressures through domestic policy. The current climate of mutual suspicion can exacerbate domestic political tensions through accusations of outside actors interfering to shape popular perceptions via proxy forces, media manipulation or threatening military gestures. Fourth, technological innovation exacerbates the risk of conflict. A new arms race is developing in weaponized robotics and artificial intelligence. Cyberspace is now a domain of conflict, and the Arctic and deep oceans are being opened up by remote vehicle access; in each case, there is no established system for policing responsible behaviour. Because research and development of “dual-use” technologies takes place largely in the private sector, they can be weaponized by a wider range of state and non-state actors – for example, the self-proclaimed “Islamic State” has used commercial drones to deliver bombs in Syria, and open-source technology could potentially create devastating biological weapons. Existing counter-proliferation methods and institutions cannot prevent the dissemination of technologies that exist in digital form. Fifth, while risks intersect and technologies develop quickly, too often our institutions for governing international security remain reactive and slow-moving. As Figure 2 illustrates, a cluster of interconnected environment-related risks – including extreme weather events, climate change and water crises – has consistently featured among the top-ranked global risks for the past seven editions of The Global Risks Report. Environment-related risks again stand out in this year’s global risk landscape (see Figure 3, with every risk in the category lying in the higher-impact, higher-likelihood quadrant. Environmental risks are also closely interconnected with other risk categories. Four of the top ten risk interconnections in this year’s GRPS involve environmental risks, the most frequently cited of these being the pairing of “water crises” and “failure of climate change mitigation and adaptation”. This shows that ineffective management of the “global commons” – the oceans, atmosphere, and climate system – can have local as well as global consequences. For example, changing weather patterns or water crises can trigger or exacerbate geopolitical and societal risks such as domestic or regional conflict and involuntary migration, particularly in geopolitically fragile areas. Every day we spew 110 million tons of heat-trapping global warming pollution into our atmosphere. The accumulated amount of all that manmade global warming pollution is trapping as much extra heat energy as would be released by 400,000 Hiroshima-class atomic bombs exploding every single day. All that extra heat energy is disrupting the hydrological cycle, evaporating water vapor from the oceans and leading to stronger storms, more extreme floods, and deeper and longer droughts, declining crop yields, water stresses, the spread of tropical diseases poleward, and refugee crises and political instability, among other problems. Our efforts to solve the climate crisis are a race against time, but the technologies embodying the Fourth Industrial Revolution (4IR), and the implications of these changes for business and society, contain hope for the acceleration of the necessary solutions to the climate crisis. We are seeing a continuing sharp, exponential decline in the costs of renewable energy, energy efficiency, batteries and storage – and the distribution of technologies that allow for the spread of sustainable agriculture and forestry – giving nations and communities around the world an opportunity to embrace a sustainable future based on a low carbon, hyper-efficient economy. In fact, in many parts of the world, renewable energy is already cheaper than that of fossil fuels. In some developing regions of the world, renewable energy is leapfrogging fossil fuels altogether, much in the same way mobile phones leapfrogged land-line phones. Sixteen years ago, projections said that by 2010 the world would be able to install 30 gigawatts of wind capacity. In 2015, we installed 14.5 times that amount. Solar energy’s price decrease is even steeper and more exciting. Fourteen years ago, projections said that the solar energy market would grow 1 gigawatt per year by 2010 – that goal was exceeded by 17 times over. In 2015, we beat that mark by 58 times and 2016 was on pace to beat that mark 68 times over. In fact, the cost of solar energy has come down 10 percent per year for 30 years. Similar developments are likely to occur across the board as new developments in electric vehicles, smart grids and micro grids, advanced manufacturing and materials, and other areas continue to accelerate climate action. We are already seeing revolutions unfolding in areas like car sharing, forest monitoring, and data-driven reductions in industrial energy usage. But it is not just the technologies of the 4IR that are directly making a difference: it is also the transformative operating models inherent within these technologies that contain the seeds for change. The Internet of Things has introduced a world of hyper-connectivity that allows us to approach decision-making in an entirely new manner. Our increased connectivity – between one another and to the material world – enables us to transfer information and materials more efficiently to greater numbers of people. All of this is making the tools we need to solve the greatest challenges we face more effective and more ubiquitous at a previously unseen pace. We are going to prevail in our collective effort to solve the climate crisis, and it will be in large part due to our increasing ability to mitigate the burning of dirty fossil fuels through the opportunities presented to us by the 4IR. 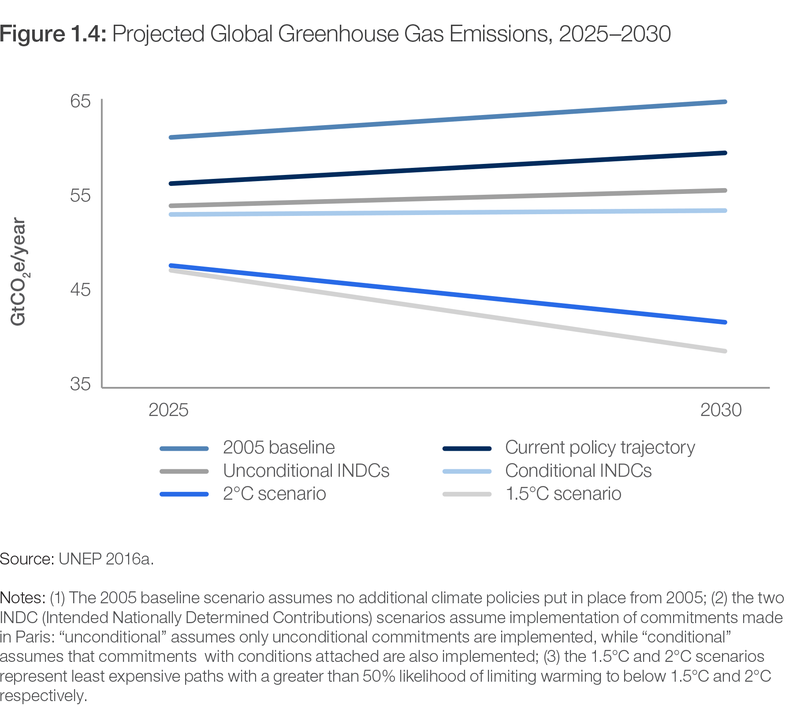 The Emissions Gap Report 2016 from the United Nations Environment Programme (UNEP) shows that even if countries deliver on the commitments – known as Nationally Determined Contributions (NDCs) – that they made in Paris, the world will still warm by 3.0 to 3.2°C.50 To keep global warming to within 2°C and limit the risk of dangerous climate change, the world will need to reduce emissions by 40% to 70% by 2050 and eliminate them altogether by 2100.51 While attention will be focused on China, the United States, the European Union, and India – which collectively comprise more than half of global emissions – all countries will need to ratchet up their action in order to limit warming to 2°C. As warming increases, impacts grow. The Arctic sea ice had a record melt in 2016 and the Great Barrier Reef had an unprecedented coral bleaching event, affecting over 700 kilometres of the northern reef.58 The latest analysis by the UN High Commissioner for Refugees (UNHCR) estimates that, on average, 21.5 million people have been displaced by climate- or weather-related events each year since 2008,59 and the UN Office for Disaster Risk Reduction (UNISDR) reports that close to 1 billion people were affected by natural disasters in 2015.60 Communities from Alaska to Fiji and Kiribati have already been relocated or are making plans to do so because the rising sea level threatens their lands.61 The World Bank forecasts that water stress could cause extreme societal stress in regions such as the Middle East and the Sahel, where the economic impact of water scarcity could put at risk 6% of GDP by 2050.62 The Bank also forecasts that water availability in cities could decline by as much as two thirds by 2050, as a result of climate change and competition from energy generation and agriculture. The Indian government advised that at least 330 million people were affected by drought in 2016.63 The confluence of risks around water scarcity, climate change, extreme weather events and involuntary migration remains a potent cocktail and a “risk multiplier”, especially in the world economy’s more fragile environmental and political contexts. Taking a systemic view also implies accounting for new risks that could be created by successful action to address environmental risks. For example, the transition to a low-carbon future will require measures in some economies to absorb potential labour-market impacts. China’s announcement in early 2016 that it will reduce its coal and steel sector workforce by 1.8 million (15%) over two years, resettling affected workers in response to industrial overcapacity, may provide a glimpse of what is to come.65 While most research suggests the shift to clean energy could create a substantial increase in net employment,66 the overall policy equation is complex and may require new approaches to skills training and retraining, along with measures to facilitate increased labour-force mobility. Ensuring a just transition will be important for societal stability. Issue-specific and organization-specific silos will need to be dismantled across the public and private sectors throughout the world economy. In their place, new multi-actor alliances and coalitions for action will need to be built, cutting horizontally across traditional boundaries of interest, expertise and nationality. The rise of such multidimensional cooperation to manage our global environmental commons will be challenging in the international context described above, but essential if we are to respond adequately to the structural risks posed by climate change, extreme weather, and water crises. Acemoglu, D. and J. A. Robinson. 2012. Why Nations Fail: The Origins of Power, Prosperity, and Poverty. New York: Random House. Capital Economics. 2016. “The end of the Golden Age”. Emerging Markets Economics Focus, Capital Economics research published 13 October 2016. Dalton, R. J. 2004. Democratic Challenges, Democratic Choices. The Erosion of Political Support in Advanced Industrial Democracies. New York: Oxford University Press. Darvas, Z. and G. Wolff. 2016. An Anatomy of Inclusive Growth in Europe. Brussels: Bruegel. Eaton, J., S. Kortum, B. Neiman, and J. Romalis. 2011. “Trade and the global recession”. NBER Working Papers 16666. Cambridge, MA: National Bureau of Economic Research. Economist Intelligence Unit. 2015. Democracy Index 2015: Democracy in an Age of Anxiety. London: The Economist Intelligence Unit. Gabaix, X. and A. Landier. 2008. “Why has CEO pay increased so much?” The Quarterly Journal of Economics 123 (1): 49–100. Goldin, C. D. and L. F. Katz. 2008. The Race between Education and Technology. Cambridge, MA: Belknap Press of Harvard University Press. Inglehart, R. F. and P. Norris. 2016. “Trump, Brexit, and the Rise of Populism: Economic have-nots and cultural backlash”. HKS Faculty Research Working Paper No. RWP16-026. Cambridge, MA: Harvard Kennedy School. Inglehart, R. and C. Welzel. 2005. Modernization, Cultural Change and Democracy: The Human Development Sequence. New York: Cambridge University Press. Larrain, G., J. M. Benavente, F. Atria, A. Joignant, and J. Couso. 2013. El Otro Modelo: del orden neoliberal al régimen de lo público. Santiago: Debate. Lustig, H., C. Syverson, and S. Van Nieuwerburgh. 2011. “Technological change and the growing inequality in managerial compensation”. Journal of Financial Economics 99 (3): 601–27. Mair, P. 2013. Ruling the Void: The Hollowing of Western Democracy. London: Verso. McCloskey, D. N. 2016. “The formula for a richer world? Equality, liberty, justice”. The New York Times: The Upshot, 2 September 2016. http://www.nytimes.com/2016/09/04/upshot/the-formula-for-a-richer-world-equality-liberty-justice.html?_r=0 . Milanovic, B. 2012. “Global income inequality by the numbers: In history and now –an overview”. Policy Research Working Paper Series 6259. Washington, DC: World Bank. ———. 2016. Global Inequality: A New Approach for the Age of Globalization. Cambridge MA: The Belknap Press of Harvard University Press. Murphy, K. M. and R. H. Topel. 2016. “Human capital investment, inequality and economic growth”. NBER Working Papers 21841. Cambridge, MA: National Bureau of Economic Research. Pinkovskiy, M. and X. Sala-i-Martin. 2009. “Parametric Estimations of the World Distribution of Income”. NBER Working Papers 15433, Cambridge, MA: National Bureau of Economic Research. Sala-i-Martin, X. 2006. “The world distribution of income: Falling poverty and … convergence, period.” The Quarterly Journal of Economics 121 (2): 351–97. Schwab, K. 2015 The Fourth Industrial Revolution. Geneva: World Economic Forum. Sherwin, R. 1981. “The economics of superstars”. The American Economic Review 71 (5): 845–58. World Economic Forum. 2007. Global Risks 2007: A Global Risk Network Report. Geneva: World Economic Forum. ———. 2008. Global Risks 2008: A Global Risk Network Report. Geneva: World Economic Forum. ———. 2009. Global Risks 2009: A Global Risk Network Report. Geneva: World Economic Forum. ———. 2010. Global Risks 2010: A Global Risk Network Report. Geneva: World Economic Forum. ———. 2011. Global Risks 2011: Sixth Edition: An Initiative of the Risk Response Network. Geneva: World Economic Forum. ———. 2012. Global Risks 2012: Seventh Edition. Geneva: World Economic Forum. ———. 2013. Global Risks 2013: Eighth Edition. Geneva: World Economic Forum. ———. 2014. Global Risks 2014: Ninth Edition. Geneva: World Economic Forum. ———. 2015. Global Risks 2015: 10th Edition. Geneva: World Economic Forum. ———. 2016a. The Global Risks Report 2016: 11th Edition. Geneva: World Economic Forum. 1 These problems did not begin with the financial crisis. For example, Russell Dalton (Dalton, 2004) was writing about “the erosion of political support in advanced industrial democracies” in 2004, and one prominent argument about “the hollowing out of Western democracy” looks to the 1990s as a pivotal decade for declining public engagement in politics (Mair, 2013). 3 World Economic Forum Global Risks Reports, various years. 4 For evidence of global falling inequality see McCloskey 2016; Pinkovskiy and Sala-i-Martin 2009; Roser 2016. 6 Goldin and Katz 2008; Murphy and Topel 2016. 7 Gabaix and Landier 2008; Lustig, Syverson, and Van Nieuwerburgh 2011. 9 See Darvas and Wolff (2016) on the “jobs polarization” hypothesis, which suggests that technology leads to increased demand for high-skilled and lowest-skilled labour, leading to a hollowing out of the middle class. 11 See Eaton et al. 2011; Hoekman 2015; World Economic Forum 2016b. 13 Larrain et al. 2013. 14 quantitative easing has also exacerbated income inequality by boosting returns enjoyed by the owners of financial assets,[fn 15]Middeldorp 2015. 21 See, for example, the performance of the National Front in France; Alternative for Germany in Germany; Sinn Fein in Ireland; the Freedom Party in Austria; the Party for Freedom in the Netherlands; Law and Justice in Poland; the Danish People’s Party in Denmark; Fidesz in Hungary. 23 Galeotti and Bowen 2014. 24 The Economist 2016; Oxford Dictionaries 2016. 25 Inglehart and Welzel 2005. 26 Inglehart and Norris 2016. 27 Pew Research Center 2016. 28 The Economist Intelligence Unit 2015. 29 Mair 2013, pp. 37–42. 30 Mair 2013, p. 2. 31 Building on his research into intergenerational conflicts in ageing societies (Ahlfeldt, Maennig, and Steenbeck 2016), Gabriel Ahlfeldt notes that a “back-of-the-envelope” calculation suggests that the United Kingdom’s Brexit vote would have swung the other way if the electorate had been an average of three years younger, which corresponds to going back in time to the mid-1990s (Ahlfeldt No date). 33 Frey and Osborne 2013. 34 Chui, Manyika, and Miremadi 2015. 38 See for example, as shown in the deliberations of the International Summit on Gene Editing in December 2015 (http://www.nationalacademies.org/gene-editing/Gene-Edit-Summit/index.htm) and in the US Federal Automated Vehicles Policy, released in September 2016 (https://www.transportation.gov/AV). 40 Juma 2016; see also AquaBounty Technologies 2016. 45 Frankfurt School-UNEP Centre/BNEF 2016. 51 IPCC 2014, p. 20. 57 Dlouhy and Harris 2016. 58 Coral Reef Studies 2016. 59 IDMC 2016; UNHCR 2016. 61 For information on relocation plans for Alaska, see Malo 2016; for Fiji see Climate Home 2014; for Kiribati see Chapman, 2012. 62 van der Heijden, Otto, and Maddocks 2015; World Bank 2016. 66 OECD 2012a, paragraph 70, p. 38.